11am this Saturday (in Australia) the ABC are replaying Delightful Rain – A celebration of Australian Surf Music. If you haven’t seen it before be sure to watch it. Have a look at the video of Cry for a Shadow, a song from the new album. Watch the video. Check out the video of Surf’s Up, a song from Revenge of the Surf Guitar, recorded on yet another beautiful Sydney beach. Watch the video. The Atlantics Live at Freshwater is now on sale through Bombora. This is the entire Delightful Rain concert and includes new songs as well as some old favourites. Buy it now. Martin was interviewed in the Manly Daily about the Atlantics gig at the boatshed on November 5th. Read it here. Read about the guitars used on each track of the Odd One Out. 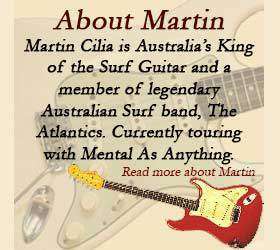 Martin won 2 JPF Awards for “Best Surf Album” for Revenge of the Surf Guitar & “Best Surf Song” for Return of the Surf Guitar. This is the second time he’s won a JPF songwriting award. The first was in 2007 for the song Point Zero (by The Atlantics). Have a look at a preview video of Pick On Me, a song from the new album. Watch the video. Listen to Cry For a Shadow, a song from the new album on Martin’s MySpace page. Have a listen. Get a copy of Aust. Guitar Issue 74 to watch a video interview with Martin on the cover CD. Read more . Check out the show on ABC TV Thursday 26th March at 8.30pm. This series features songs by Martin and The Atlantics. You can buy the CD or DVD from http://www.bombora.net.au/ . Martin guitar picks on sale! You can buy packs of 10 picks with Martin’s picture on them. More info here. The clip of “Return of the Surf Guitar” and “Joey Black” (with Dave Warner at the Bon Scott Memorial Concert) have been added to the downloads page.